Creating a space for sharing medicine through poetry, food & seed knowledge, herbalism, music and more. This is a space for reclaiming knowledge from an indigenous feminist lens. Each issue we will continue to grow and share the knowledge of our matriarchs and share that medicine. Indigenous Goddess Gang is a space intended for INDIGENOUS people. We've had our land taken from us, we've had our cultures taken from us, we've had our languages taken from us. This is a step towards reclaiming our knowledge, identity and medicine. This site is not intended for exploiting or appropriating. Tread lightly and respectfully. Indigenous Goddess Gang Indigenously. Reclaim. Identity. Welcome to The Indigenous Goddess Gang Femme Magazine! Greetings Relatives! 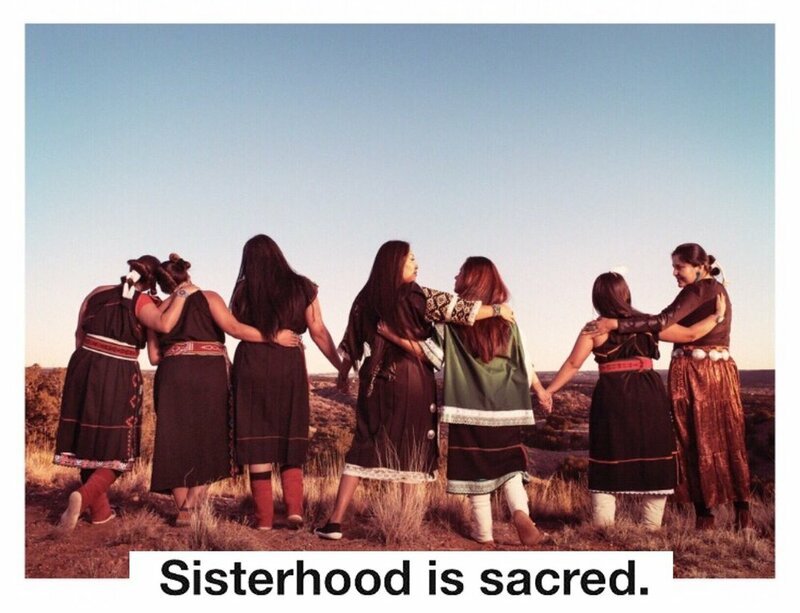 We are honored to present the third issue of our magazine, "Sisterhood is Sacred". This issue has blessed us with the opportunity to re-establish kinship with our Pueblo Relatives. Our elders tell us of days when neighboring tribes would gather, trade, feast & dance. We honor these relationships and look forward to working with other tribes across Turtle Island and Globally. We will do our best to keep growing and learning and to share what we can. It is up to us all to collectively work to reclaim indigenous and femme power! This month's fashion shoots are the first in a series to honor our Pueblo Relatives! This series will be ongoing as we would like to honor & represent all 19 Pueblos. In this issue alone we teamed up with Kewa, Ohkay Owingeh, Hopi, Cochiti, Zuni, Jemez, Laguna and Nanbe' Owingeh sisters. We had the honor of working with Photographers Cara Romero & Leah Rose who stepped up and delivered stunning images of our Pueblo Sisters. Our goal in this series is not only to re-establish kinship with our Pueblo relatives but also learn about the different Pueblo villages. Like all indigenous communities, they are not all the same. Our ultimate goal as a collective is to deconstruct stereotypes and reclaim our diversity as indigenous peoples, while uniting through our many intersections. It has been an honor to work and learn from these fierce and kind Pueblo Matriarchs. Each month we will create a space for sharing medicine; whether it be poetry, food & seed knowledge, herbalism, music and more. This a space for reclaiming knowledge from an indigenous femme lens. Each month we will honor a different tribe of matriarchs in our fashion shoots. Each month we will continue to grow and share the knowledge of our matriarchs and share that medicine. Thank you for your support. The emails, well wishes & praises we have received reassure us that the matriarch medicine is working & is needed! Indigenous Goddess Gang is a space intended for INDIGENOUS people. We've had our land taken from us. We've had our cultures taken from us. We've had our languages taken from us. This is a step towards reClaiming our knowledge, identity and medicine! This site is not intended for exploiting or appropriating. Tread lightly and respectfully. "As a project which centers indigenous women, we also recognize the crucial work of our queer, trans, two-spirit and non-binary communities, and we acknowledge that we have a lot of work to do; to walk together, to reclaim our knowledge together and to move forward together."